New hope for deadly pediatric brain tumors; opening the door to improved diagnosis and treatment of epilepsy in children; and advanced genetic testing to better understand the causes of autism and cancer in kids. These research projects are currently underway at UCLA Mattel Children's Hospital under the umbrella of the UCLA Children's Discovery and Innovation Institute (CDI), and aim to dramatically improve the lives of children with serious illnesses. 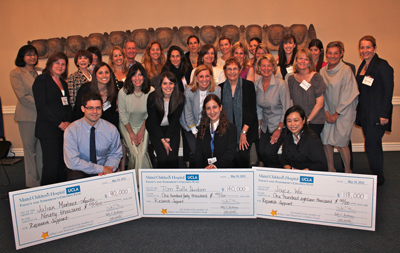 To help support this work with critically-needed research dollars, a group called Today's and Tomorrow's Children Fund (TTCF) presented a total of $348,000 to UCLA researchers during the 7th Annual Faculty Presentation and Awards Day on May 10. "Not only does UCLA Mattel Children's Hospital provide world-class patient care, but our faculty members are also in the CDI's laboratories studying the causes of diseases that afflict our patients and searching for new treatments and cures," said Dr. Sherin Devaskar, professor of pediatrics, executive chair of the department of pediatrics, physician-in-chief at UCLA Mattel Children's Hospital, and assistant vice chancellor for children's health with the UCLA Health. "However because of limited federal research dollars, we must rely on additional avenues for funding. TTCF is an innovative way for the community to embrace the work of our pediatric subspecialty physician researchers and actively participate in the exciting process of advancing science." The grand prize of $140,000 was presented to Dr. Tom Belle Davidson, assistant professor of pediatric hematology/oncology, for her work in studying a potential therapy for one of the deadliest types of pediatric brain tumors called high-grade gliomas which have few treatment options and an overall five-year survival rate of only 10 to 30 percent. Based on current UCLA research underway for adult brain tumors, as well as a pilot study conducted among a small number of pediatric patients, this phase-1 trial for children will study a vaccine created from immune system cells-called dendritic cells (DC)-taken from the patient's blood and treated with broken-down cells isolated from his or her tumor tissue during surgery. These stimulated DCs will then be injected back into the patient as a vaccine in order to teach the host immune system to identify the malignant brain tumor cells as "foreign" to the body. Researchers hope the treatment will show improved outcomes with fewer toxic side effects than current standard therapies. Additionally, Davidson's team will investigate the use of a topical compound cream on the vaccination site that stimulates the innate immune system and has been shown to display antiviral and antitumor activity. Dr. Joyce Wu, associate professor of pediatric neurology, won a prize of $118,000 to help advance her team's research into pediatric epilepsy, including types of the diseases that do not respond to medication. The researchers have already discovered in children with epilepsy that ultra-fast brain electrical activity called high-frequency oscillations (HFO) are found throughout the brain and are a potential biological marker-or biomarker-to help assess, monitor and predict the condition. This finding has been seen without the use of invasive surgical implants inside patients' heads for days to weeks as part of their epilepsy surgery evaluation and was correlated to surgical removal of seizure-causing zones resulting in seizure freedom. Moving forward, the TTCF gift will allow Wu's team to expand on the concept of HFO. Two goals include correlating the presence of HFO in children who are at high-risk of developing epilepsy later in life due to an inadequate oxygen supply at birth, a traumatic brain injury or tuberous sclerosis complex-formation of tumors in the brain or other vital organs. Additionally, with the ability to interpret HFO "live" in the operating room and immediately study affected brain tissue, this could potentially lead to a better understanding of the development of epilepsy and new antiepileptic drugs. The research holds promise for future clinical trials for better surgical brain mapping and potential disease-modifying therapy to prevent the development of epilepsy altogether, not merely stopping seizures with anticonvulsant medications. Dr. Julian Martinez-Agosto, assistant professor of human genetics and pediatrics, was awarded $90,000 for his research focused on the genetic risk factors of autism and cancer predisposition. Martinez-Agosto's laboratory work focuses on genetic conditions in which children experience overgrowth-meaning their bodies grow faster than their peers. A subset of these children has autism. By using the latest technologies, they are able to identify the genetic changes in these children in order to expand their understanding of the causes of autism and, in some cases, a predisposition to cancer. Support from TTCF will enable Martinez-Agosto and his team to use a new, efficient way to establish a personalized genetic-based diagnosis called "next generation whole exome sequencing" to identify mutations in pediatric patients with overgrowth syndromes. This technology will allow them to look at each letter in the patient's genes, sequencing DNA to identify rare mutations that are predicted to cause autism, overgrowth, and/or cancer predisposition. The findings are expected to enhance the understanding of the genetic risk factors for autism and the biology of pediatric growth disorders, as well as provide new potential targets for therapies. In 2006, the Today's and Tomorrow's Children Fund was born out of the belief that, by pooling their donations, a group of committed individuals could award an annual gift to support the research of talented pediatric faculty members at UCLA Mattel Children's Hospital. Each year, TTCF members vote on a ballot of select research projects and the three faculty members receiving the most votes present their research to the group, who then select the winning presentations. TTCF currently includes 67 members from the community and continues to grow each year. To date, the group has donated a total of $1.5 million to 13 researchers at UCLA. Ultimately, the group hopes to expand to 200 members in order to provide an annual award of $1 million. For more information on TTCF, please contact (310) 267-1836.